Until the premiere of Manon Lescaut, Puccini’s career progress was erratic. His first opera, Le villi in 1884, was well received, but his second, Edgar, had a disastrous premiere in 1889. A successful third opera was essential if the composer was to keep his publishing contract. He triumphantly achieved it in 1893 with Manon Lescaut, which led him to be hailed as ‘an Italian genius’ and ‘one of the strongest, if not the strongest of the young Italian composers’. How did he pull it off? One major factor was Puccini’s enthusiasm for his subject. Puccini’s librettist Ferdinando Fontana came up with the relatively obscure scenarios for Le villi, based on the same European legend as the ballet Giselle, and Edgar, based on a dramatic poem by Alfred de Musset. Puccini’s muted reaction to both contrasts sharply with his excitement about an opera based on Prévost’s popular novel L’Histoire du Chevalier Des Grieux et de Manon Lescaut. 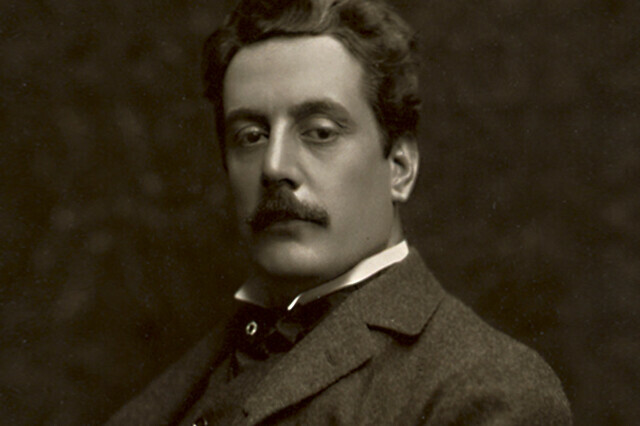 Even when his publisher Giulio Ricordi attempted to dissuade him on the grounds that Massenet’s successful Manon (1884) was on the same subject, Puccini stood firm, declaring that while Massenet’s score was ‘all powder and minuets’ he would tell Manon’s story ‘like an Italian, with desperate passion’. As became evident later in his career, Puccini always found competing with another composer inspirational. Puccini’s operas are known for their vivid sense of place, but he seems to have got little inspiration from the medieval Germany of Le villi or the 14th-century Flanders of Edgar, and both operas have been criticized for generic rustic choral scenes and derivative writing (particularly Edgar, influenced by Bizet’s Carmen). By contrast, Manon Lescaut’s various settings inspired Puccini to wonderfully atmospheric writing, with particular highlights including Act I’s bustling crowd scenes, Act II’s neoclassical Parisian divertissements and the bleak opening of Act IV, where muted and tremolando strings, brass and harp evoke a barren wasteland. Puccini played a major role in shaping Manon Lescaut’s libretto, displaying the obsessive perfectionism that was to make his future operas so effective as music dramas. He had more or less let Fontana get on with the librettos of Le villi and Edgar unassisted – which he believed had contributed to Edgar’s failure. For Manon Lescaut, Puccini not only refused to work with Fontana but also gave constant advice to his team of librettists, dismissing one after the other as their work left him unsatisfied. Only when Ricordi paired him up with the experienced Luigi Illica was Puccini happy – and rightly so, as Illica invented Act III’s memorable embarkation scene. Musically, Manon Lescaut is more sophisticated than Puccini’s previous operas. Puccini heard Parsifal and Die Meistersinger von Nürnberg at the 1888 Bayreuth Festival, got to know Tristan und Isolde around the same time, and in 1889 advised on cuts for Die Meistersinger’s premiere at La Scala, Milan. All this made its mark on Manon Lescaut. Manon and Des Grieux’s love music is infused with Tristan-like chromatic harmony and soaring melodies, and opera scholar Julian Budden has noted similarities between the solo string passage opening Manon Lescaut’s intermezzo and the start of Die Meistersinger’s Act III prelude. Puccini also makes inventive use of recurring motifs, the most memorable of which is a ‘Manon’ motif, which eventually fragments and dissolves in Act IV as Manon dies. But Manon Lescaut is no Wagner imitation: Puccini also maintained a distinctively Italian lyricism in the opera’s many melodies, particularly in arias such as Des Grieux’s ‘Donna non vidi mai’ and Manon’s ‘In quelle trine morbide’. Puccini employed the skills he’d developed in Manon Lescaut at an even higher level in his next work, La bohème. The libretto, written by Illica and playwright Giuseppe Giacosa, is more finely crafted: while in Manon Lescaut only the lovers are fully realized, in La bohème Puccini creates six interesting, believable and sympathetic principal characters. Musically the score is even more sophisticated, blending lyricism with elements of realism, including parlando and speech, and using motifs in a still more interesting way. In itself a magnificent achievement, Manon Lescaut was also the harbinger of Puccini’s even greater operas to come. Le Villi and Edgar are not second rate operas! Both operas contains much that is memorable especially the preludes in Edgar. No one should be put off listening to these two operas on cd. Mosco Carner in correspondence with myself saw both operas in Treviso. Mosco Carner in one of his letters to me wrote that these operas proved that Puccini was a borne opera composer.